The devotional energy inside the Meenakshi Amman temple is so intense that it could convert an atheist into a devotee of Parvati. Or maybe it felt that way only because I visited the temple one day before deepavali when the crowds were greater than usual (if they were), or maybe I had been building up this visit to the “symbol of Tamil culture” in my head. 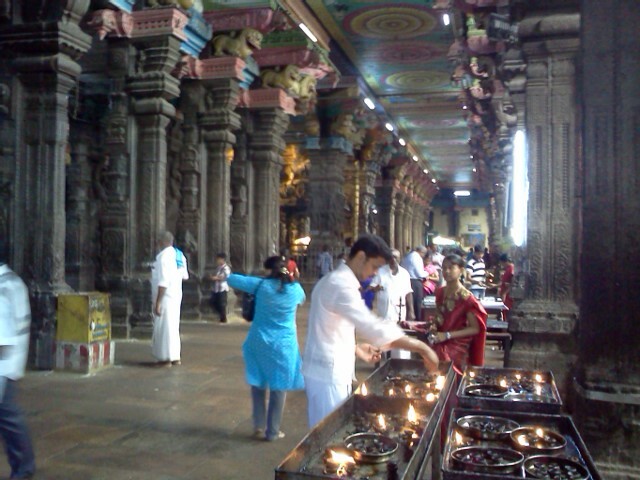 In any case, my experience of this temple was quite intense. 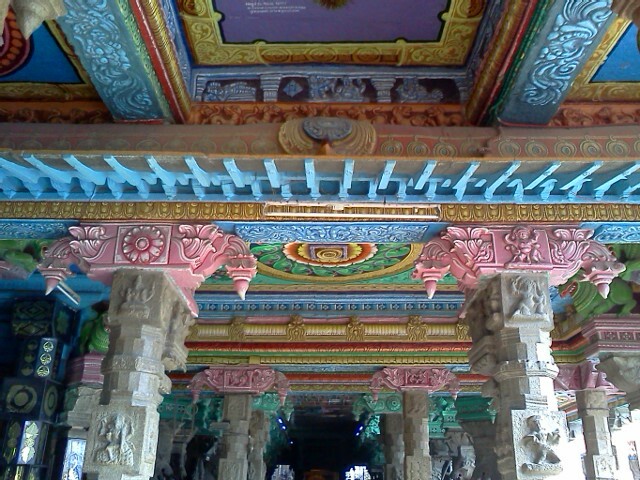 One of the contributing reasons is definitely the labyrinthine nature of the temple. 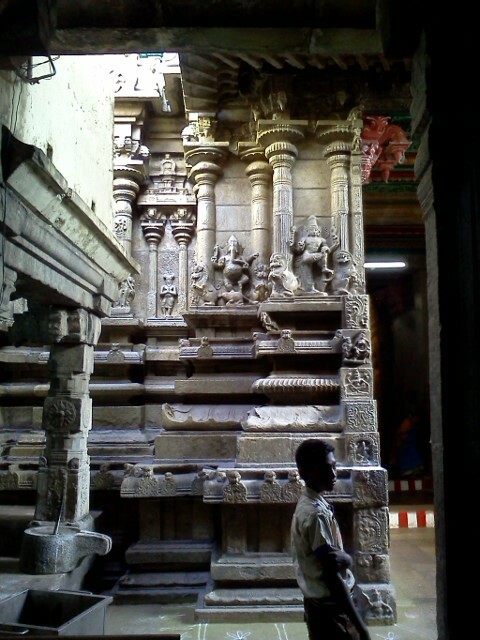 In the usual large Nayyaka-era temple in Tamil Nadu, the could-get-lost quality is attained by the concentric rectangular enclosures/courtyards created by successive walls and gopurams that visitors have to pass through, making it hard to remember exactly what level of enclosure/courtyard one is in. Adding to this confusion are the side shrines, collonades, mandapas and pavilions in each enclosure, and all the life and activity at each of these. 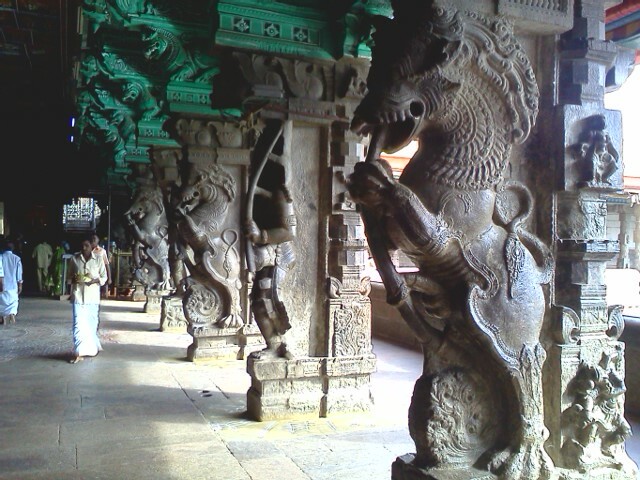 In the Meenakshi temple, all of this is heightened. 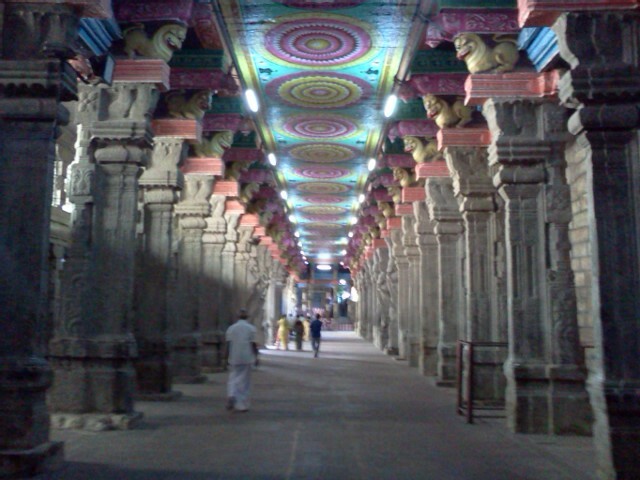 When you stand outside the Meenakshi temple proper, it doesn’t look too big. 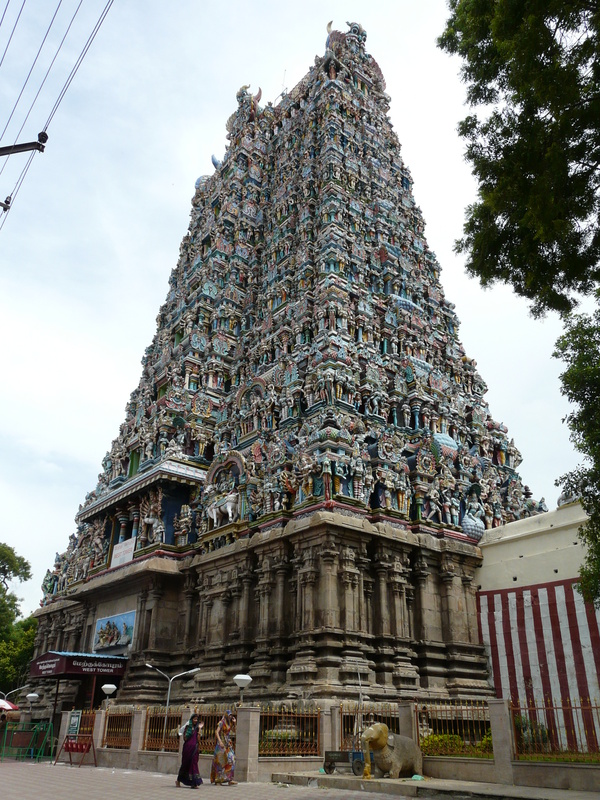 The large outer gopurams are visible from far inside the dense old town of Madurai that surrounds the temple, but once one is adjacent to the temple itself, the wide open walkway area on all sides of the temple allow for the ends of the temple visible, and even though the length of the temple wall is about 280 meters (the width is about 250 meters), the ability to see all of it from one spot makes the entire compound seemingly more comprehensible. It is when one enters the outer gopurams that the heightened confusion begins. In most other such temples, the regularity of the concentric rectangular enclosures gives some kind of order to the labyrinthine feel of the place, but in the Meenakshi temple no such concentricity exists any more. 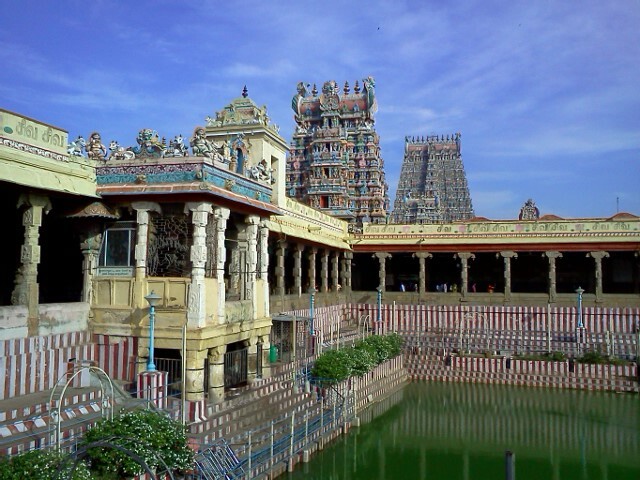 Spatially, the central shrine of the temple is not the Meenakshi Amman shrine, but rather the Shiv shrine of Sundareshwara. If the temple had been just the Sundareshwara shrine alone, then it would have had the confusion level of just any other Nayyaka-era temple. 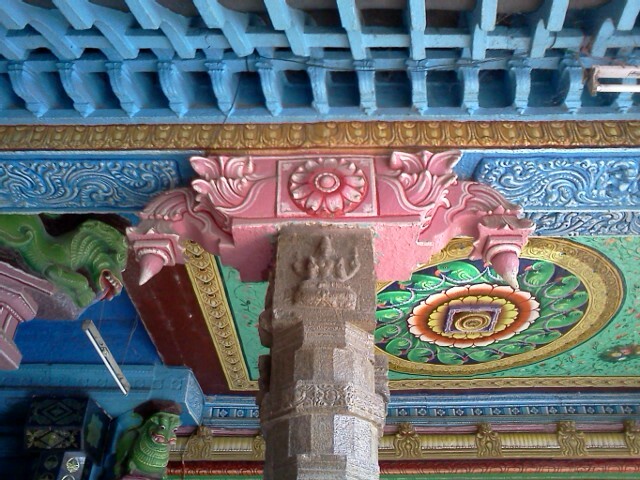 However, the Meenakshi shrine here creates a dual, almost competing (power) center. As a result of this, the inner gopurams are not aligned to just one shrine, but two, and so are the inner enclosing walls. Thus there are two sets of inner entrance towers and enclosing walls. The covered colonnaded passageways in such temples usually circumambulate around a single main shrine, but here with two important shrines within the same temple, there is a forest of (ordered) colonnades that have to wrestle competing gravitational pulls of attention. 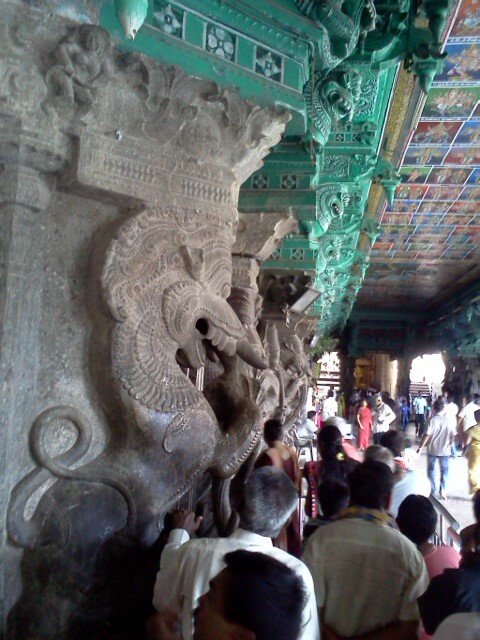 For example the colonnade that passes from the southern outer gopuram towards the Sundareshwara shrine also passes in front of the gopuram that is at the eastern entrance to the Meenakshi shrine. Some devotees move towards the Shiv shrine, and many more turn towards the Parvati shrine. Such colonnades for both shrines have resulted in the entire inner enclosures being almost entirely occupied by colonnaded ceilings, with hardly any spaces left open-to-air, except for the large temple water tank. Add to this the large colonnaded mandapas built adjacent to the shrines, and the almost mystical labyrinthine effect is complete. 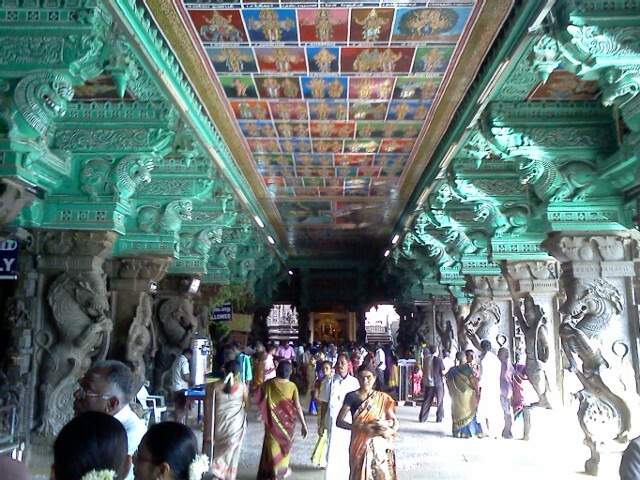 To top it all, the (relatively) much smaller Meenakshi shrine receives the bulk of devotees, creating a misalignment between the spatial and devotional foci of the temple. 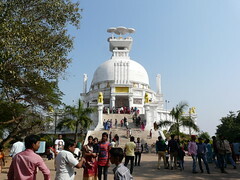 The competing shrines create a dual spiritual foci, and in this case the peripheral shrine is the more visited. Devotees of course would say that the shrines and spiritual foci are complementary and not competing, but I feel there is a bit of both! When I visited the temple, the “free” line (as opposed to the 20, 50 and 100 Rs lines that get you a quicker audience with god) at the Meenakshi shrine was much much longer than the free line at the Sundareshwara shrine. 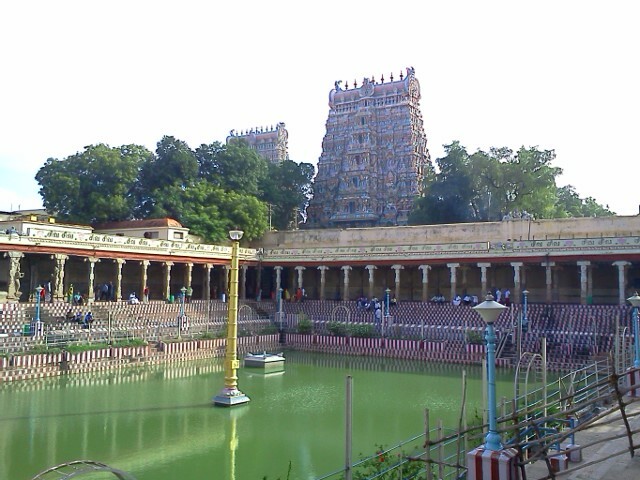 For an introduction to my Tamil Nadu Temple Run trip, visit the first (Chidambaram) post. The photos in this post also available on flickr. 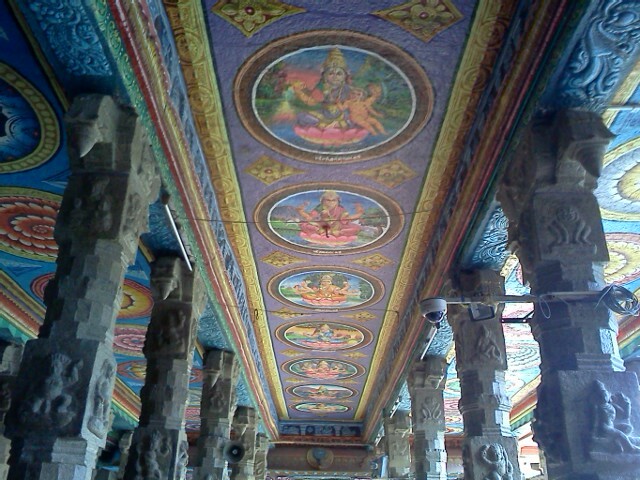 Unfortunately I was not allowed to take my camera inside the temple at all, and so had to rely on the much lower quality photos from my phone camera instead. 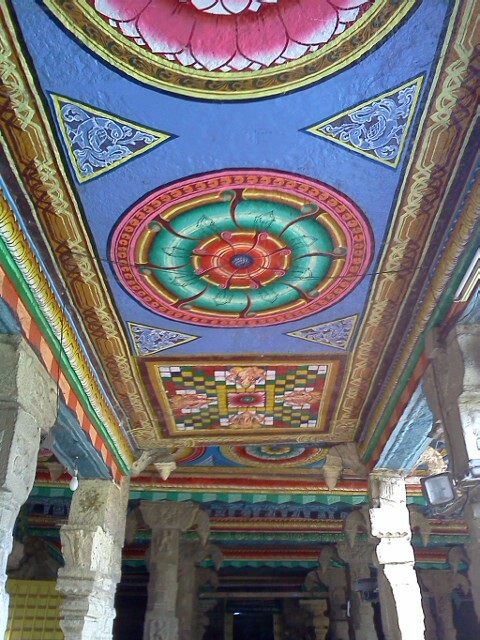 This entry was posted in Tamil Nadu and tagged india history, madurai, tamil nadu, temples. Bookmark the permalink.